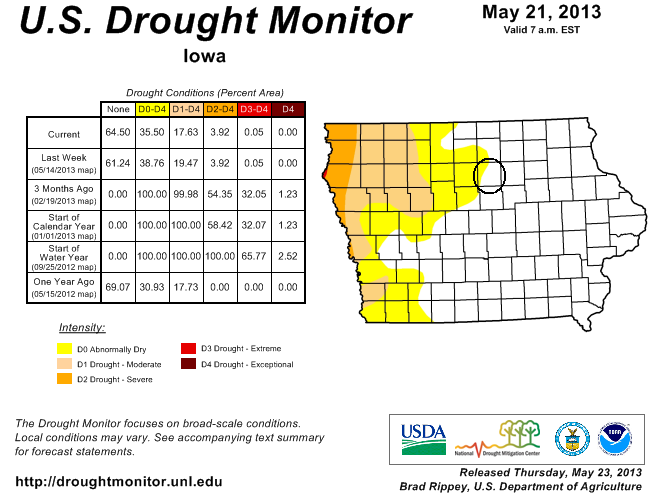 Last year I talked about the drought many times and even this year I've continued to talk about the drought. 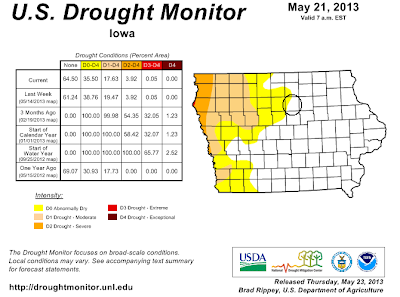 Well, I don't think anyone in our area, and actually throughout the state of Iowa, is concerned about being in a drought anymore... Let's just say we've gotten our fair share of rain lately! I have circled the county where we live and farm. On Saturday we received around 2 inches of rain and then overnight into Sunday we received an additional 4 inches of rain! Normally on the Sunday of Memorial Day Weekend My Farmer, LP and I go to church and then go to a Memorial Day service at the cemetery - not this year... Instead we were busy making sure everything was alright at our current house, our new home and at our hog site. On Sunday water was ponded past our apple tree. but you can still see how wet it is. Our sump pump has been working nonstop since Sunday at our current house and finally today it is taking a breather and only pumps every so often. I think I might actually be able to do some laundry today because now the laundry washer's water will have somewhere to go! Our new house only had a little bit of water in the basement thankfully and our hog buildings were fine. We were a little worried the hog barns were going to get water into them on Sunday morning but the rain stopped just in time that we didn't have to stress about that. But stress is still high as we have large ponds in all of our fields. Not only are we worrying about drowning out the corn that is planted in some of those fields, we are also worrying about the corn and soybeans we still have to plant! And it doesn't look like this week there will be a good chance of getting field work done with a chance of rain every day. Because the season is starting to go late, we are starting to talk about switching some of our intended corn fields into soybeans fields and have also talked with our crop insurance agent about preventive planting acres. This is a view to the east from our acreage where you can see several "ponds". On Sunday these were one giant "lake"! I guess the only thing that needs to happen this week, so we can get our minds off of all of this, is to have a baby! Every morning My Farmer talks to MP through my stomach telling him or her that it would be a good time to arrive! Have you been dealing with flood conditions where you live? Do you have any questions about planting this spring? I literally laughed out loud when I saw the title to your post, because we're in the same boat!! We have a deadline of May 31st, and then a 10% penalty for 10 days after that, and we have another 1,000 acres to plant or so. It also rained 2 inches on Sunday, another inch last night, and the forecast is for rain for the rest of the week! And yes, we had water in our basement this weekend too :( I feel your pain! Well, except for the whole being really pregnant thing, lol. But yeah, this would be a great week for baby to come! Rain, rain, rain and more rain here too. Have less than 100 acres of corn to go, but don't believe they will get planted before June 1st. Hope the baby arrives soon!